When it comes to dental health, I have been pretty lucky. I am one of the few people I know who never had to have braces, and I have only had one filling in my life. I’m good about brushing my teeth several times a day, and I’ve gotten a little better about flossing more frequently as I’ve gotten older. Overall, I have always been pretty satisfied with my smile, but of course, I have always wished my teeth were just a little bit whiter. It’s one of the first things people notice about you, so naturally everyone wants to feel confident about their smile. Disclosure: I was gifted the Smile Brilliant kit in exchange for social promotion; however, all opinions are my own and this post includes my honest review of the products. With that being said, I was super excited when Smile Brilliant reached out to me about trying their products. I have tried Crest White Strips in the past, but I wasn’t a huge fan of them. They didn’t stay on my teeth very well and I never stuck with using them since I didn’t see great results. I have always wanted to upgrade and get some whitening trays made specifically for my teeth from the dentist, but didn’t want to spend the money. Smile Brilliant’s products are basically identical to what you would get from the dentist, but much more affordable. They even have kits specifically for people with sensitive teeth, like me. In addition, they offer different levels of kits based on how stained your teeth are and how many treatments you might need to achieve optimal results. Once you are done making the impressions, you stick them in an envelope that they have pre-stamped and addressed for you, and send them right back to Smile Brilliant. It takes about a week or so to get your custom whitening trays back in the mail, then you are ready to whiten! I will admit — it hasn’t been a totally smooth ride for me. I have very sensitive teeth, so I haven’t been able to whiten super consistently, because my teeth and gums need a break after each treatment, but this is normal! I found it to be super helpful to buy some Sensodyne toothpaste to use after treatments and the next few days when I was experiencing any sensitivity. They recommend whitening at night before bed so you won’t be introducing any new foods or beverages that could cause staining in the hours after you’ve whitened. However, the pores on your teeth are still open in the 24-48 hours after whitening, so they recommend avoiding foods like coffee, red wine, etc. during that time. Avoiding coffee was a struggle some days, but I would just drink it through a straw if I was really desperate! What worked best for me was whitening right after dinner and before bed for about 60-90 minutes, while Ethan and I watched our nightly episode (or two) of Netflix. We have recently been obsessing over Blacklist, but now we are impatiently waiting for the latest season to get on Netflix, and watching New Girl in the meantime. The densensitizing gel. This definitely helped reduce the amount of sensitivity I was having; I would have struggled without it! The customer service. 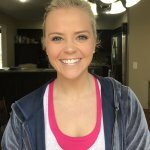 Ashley was so great about checking in with me throughout my whitening process, and providing helpful tips whenever I was experiencing more sensitivity than usual (for example, putting Vasoline on your gums to reduce sensitivity; who knew!) It was so nice to be able to reach out to her whenever I needed anything. Super user-friendly. All of the instructions for making the impressions and the actual whitening process were very straightforward and easy to follow. I didn’t have any problems figuring out what I needed to do, but if I did, I knew I could turn to Ashley (or anyone in customer support) to help me. Here are a few photos of my results! I am so happy with them! I truly didn’t realize how much staining I had until I saw my “after” photos. Shout out to Smile Brilliant for giving me a bright smile again! If you are interested in trying Smile Brilliant, head to my Instagram post from today, May 14th, 2018 and enter the giveaway I’m hosting right now. Like the photo, follow me, tag some friends, and most importantly, fill out a super quick form using this link. You could win a $149 Smile Brilliant credit, which is enough for nine whitening treatments! My giveaway is open for 1 whole week (ending May 21, 2018) and open to USA, UK, Australia and Canadian residents! If you don’t like those odds, you can go ahead and purchase some for yourself using my discount code “forthewin15” for 15% off. Look for the photo below on my IG feed! Click here if you want to check out all of their products! If you have any questions or comments about the products or my experience, please don’t hesitate to reach out!